Norfolk incinerators are the best solution for the disposal of poultry carcasses. Incineration is fast, clean and eliminates disease. The Norfolk Incinerator is easy to operate and efficient with both of our Incinerators they have full refectory lining, safety flame cut-off valves and the choice of an automatic burn time control (optional) and with no power needed. The lower burners are for the incineration and the secondary burners are to minimise the smoke emission to DEFRA approved standards. The Norfolk Incinerator is designed for outdoor use but ideally should be placed in a well ventilated fireproof shed to protect it from the elements, especially wind, rain and frost. Wind will adversely affect the burning efficiency and the secondary chamber temperature. Rain will prematurely corrode the outside of the incinerator and cold air entering the incinerator while in use can cause thermal shock i.e. cracks in the refractory lining. Keeping away from residential area’s, highways, wooden buildings and any inflammable materials. (See link for our sheds). It is recommended that any by-laws and regulations regarding the location of the incinerator are checked with the local authority. Bio-security – eliminates the spread of disease to other locations. Reduces the attraction of vermin. High temperature reduces the carcasses to fine ash. No hay espacio de la tierra desperdiciada para el entierro. Incineration is considered the most hygienic method of disposal of poultry carcasses. 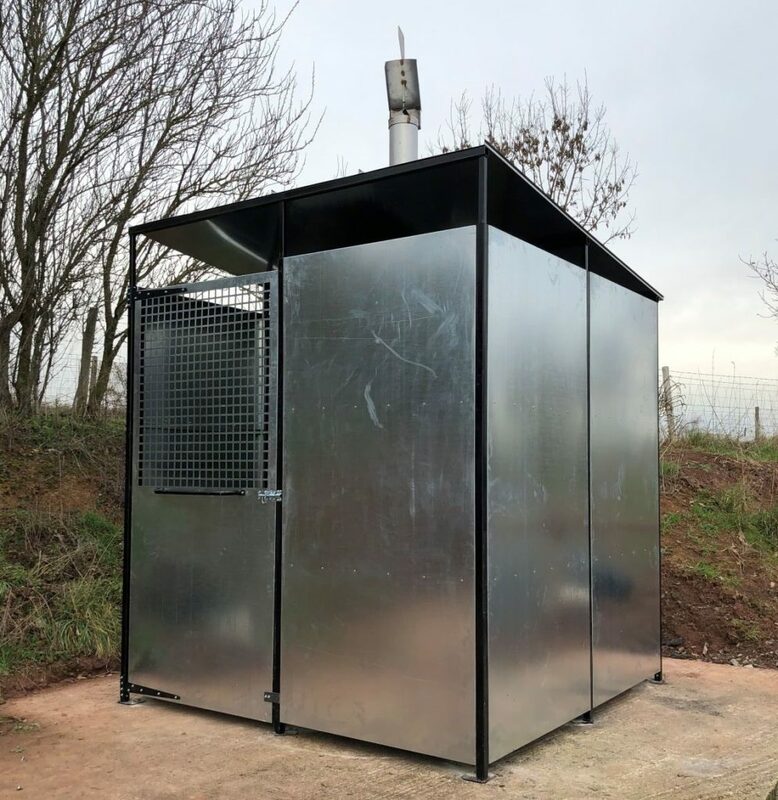 Our incinerator sheds are suitable for both of Bodo Ltd’s applications, made out of galvanised sheet for most of the exterior with mild steel box section finished in a clean gloss black connecting everything together. With a footprint of 2.5m square and an overall height of 2.8m at the highest point which accommodates both of our applications with ease and leaves enough room for users to walk around and easily use the application. The shed needs to be situated on a hard standing concrete base so that our engineers can anchor down the shed protecting the system from adverse weather applications. Utilizamos los alimentadores de giro en los cuatro de nuestros sitios Con muchas ganas. Cada corona de pollo se cría en el Giro alimentador Bodo Limited. Son de buena calidad, muy fiable y han necesitado ningún tipo de mantenimiento. Han sido excelente, y no son un problema.